When it comes to your recovering from Orthopedic Surgery, it's all about Your mindset. There are many important physical (and mental) factors that lead to a successful recovery from knee surgery. The "bad" news: some of these factors are not under your control. For example, if you are recovering from knee surgery (or any major injury/surgery, for that matter), you know that you have no control over your age- you ain’t getting any younger, kid, and the truth is that a body with more wear and tear on it is going to heal differently than a body in the springtime of its little slice of existence here on earth. Additionally, you can’t control your specific body type or genes, which also are contributing factors to recovering from any type of orthopedic surgery. Some people just naturally recover faster than others because of the particular chemistry of their body. So there you go again, something else that’s completely out of your control. Boo hoo. Now comes the good news: there are a huge host of factors that are totally and completely under your personal control when you embark on the journey to recover from surgery. I’m going to talk about a couple of the mental factors here today-- methods of mindset that you can use to speed your recovery. Let's Go! "I will be riding fresh powder soon, I will be riding fresh powder soon, I will be..."
I’m not going to get all new-agey on you here, but the truth is, one of the few things you can actually control throughout your life is your attitude. And this really shines through when it comes to recovering from major knee, shoulder, back, or any other type of surgery. Keeping it positive from the start is a BIG plus. When I see people come into their surgery already focusing on what their life will look like in the future (after the surgery) and feeling primarily optimistic about their journey, I know I’m dealing with somebody who has a great chance to have a smooth road to recovery. Let's be clear; I’m not saying to avoid some of the inevitable emotions that will come up during your recovery process. Fear, doubt, and maybe even anger that you are in this situation-- these are all healthy things to feel. But the people who can go through the majority of the recovery process with a positive outlook are more likely to be open to doing what it takes to come back stronger and healthier after an injury. It’s funny, because you hear time and time again that the some of our greatest competitors from an athletic standpoint are those who are able to take a setback and spin it into motivation. We’ve all heard how Michael Jordan turned not making the varsity team into a personal drive to become the best basketball player ever, or how many top skiers overcame multiple injuries to reach the top of the competitive skiing world. Did you ever hear the story of Erik Weihenmayer? He climbed Mount Everest, completed the seven major World Summits, and was a championship wrestler. Oh, p.s. he's BLIND. You’d better believe that Erik is one hell of a competitor who used a “weakness” that he had no control over to motivate himself to do some incredible things that most of us could only dream of. There will be times during your recovery when you’ll need to challenge yourself to adopt that sort of competitive spirit to push through your rehab, deal with the aches of recovery, or even mentally adjust to your "new" body after it is fully healed. Trust me, if you adopt a competitive, can-do spirit, it will show in your recovery-- I've seen it time and time again. When you have any kind of surgery, you not only have to trust your surgeon and their team to fix you up proper, but you also have to trust your rehab team to guide you through the process and help you do what’s right for your body. And this takes brushing some fears to the side and trusting their advice, knowledge, and experience. This isn’t their first trip to the dance floor when it comes to helping people successfully recover from surgery. On the contrary, many of the people who will be guiding your through the recovery process have advanced degrees, thousands of hours of training, and have helped hundreds and even thousands of people recover from the exact same injuries that you are dealing with. Don’t be afraid to put your trust in their capable hands. If you can combine this trust in your team with a positive attitude and a competitive spirit when it comes to your recovery from orthopedic surgery, I guarantee you, you’ll come out physically (and mentally) stronger. Get out there, get better, and most importantly, enjoy the journey! 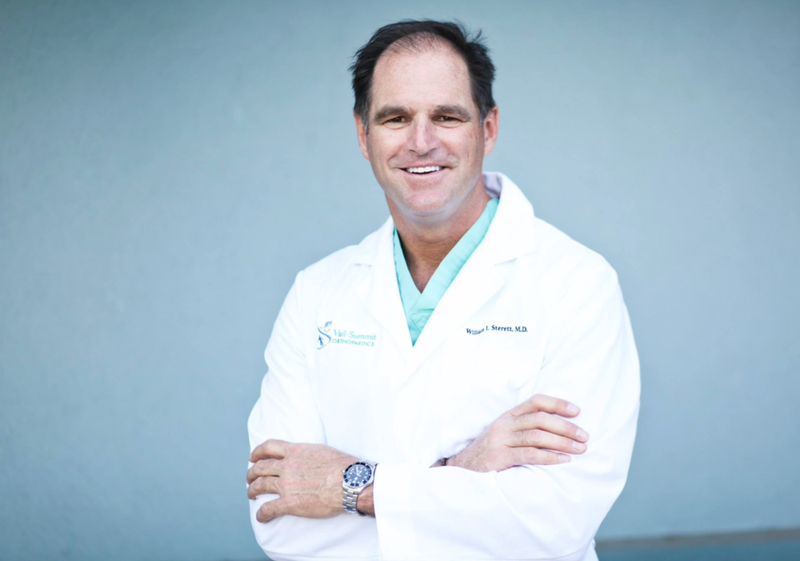 Dr. Bill Sterett is Board Certified by the American Board of Orthopaedic Surgery, a member of the American Orthopaedic Society for Sports Medicine, a member of the Arthroscopy Association of North America, and is one of the few physicians who have earned a Certificate of Added Qualification in Sports Medicine.